Recently, our own Lisa Malmgren headed off to Bolivia to get better acquainted with the ins and outs of travel to Bolivia. She started out at Lake Titicaca, on the Peruvian side of the famous lake. Lake Titicaca is arguably most well-known for its floating islands, and she notes that there are some great home stay options for the more adventurous traveler to check out. Guests can even kayak out to one of the natural islands, Isla Taquile, which also offers a light hike that’s a nice way to work your way into the altitude. Speaking of the natural islands – Isla del Sol, Isla de la Luna, and Isla Taquile – they were what really blew Lisa away. She notes that another sleeper accommodation was La Estancia Ecolodge on Isla del Sol. From Lake Titicaca, Lisa was off to La Paz where, once again, she was impressed. On Lisa’s list of recommendations for La Paz are the National Museum of Ethnography and Folklore and the dining scene. Next up was the salt flats. 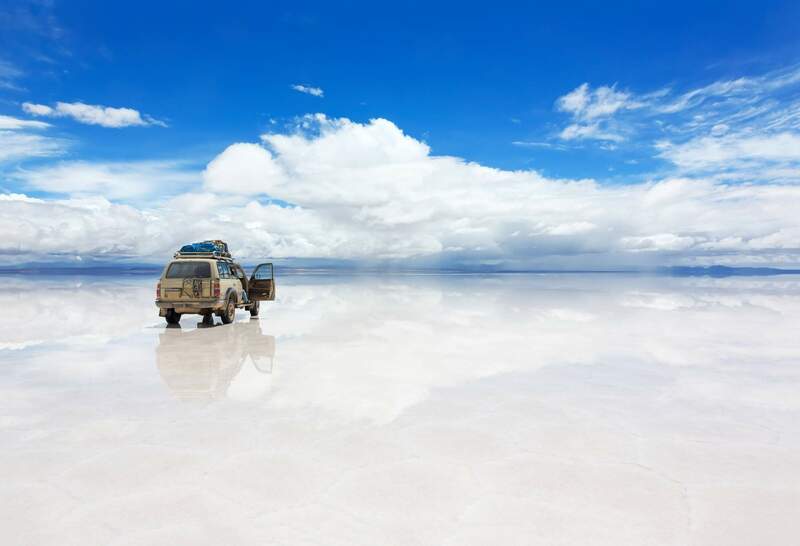 If there’s one thing Bolivia is world-renowned for it’s the salt flats. It should come as no surprise that they were the peak highlight of Lisa’s Bolivian scouting mission. “I highly recommend using this as the grand finale to a tour,” she insists. Still, she had her doubts about the experience beforehand because along the way a number of travelers she spoke to had described the trip to Bolivia’s salt flats as “too touristy.” Her guard was up. Southern Explorations travelers like to avoid the over touristy. The reality is, as soon as you drive past all the tourists taking those famous perspective pictures and selfies and out into the expanse of the salt flats, most of the time you’ll be the only people anywhere. Intrigued by the thought of Bolivia travel? Have questions like “what’s the smartest and easiest way to cross the border from Peru to Bolivia?” Then simply give Lisa a call today 877-784-5400 and get all her insight from her Bolivia trip.